We often receive queries asking how to calculate odds for league newcomers and why we don’t develop a Value Bet Calculator for league matches involving teams without head-to-head (H2H) history, or their respective last 25 matches being in different leagues. The humble answer is: Proper odds calculation is a very complex issue and it is not only difficult but impossible to pack all applicable approaches and formulas into one single, easily understandable spreadsheet. In our experience, matches involving teams with less than 25 games within a comparable group (e.g. teams with data sets from the same league), require a much deeper statistical analysis and a wider variety of data collection. Nevertheless, no matter how accurate the calculations, observed results have the unfortunate habit of strongly deviating from expectations. Even the bookmakers find it challenging to price newcomers accurately. 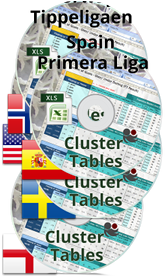 Our HDAFU tables show many newly promoted teams making big profits at home, away, or both. The public thinks newcomers have little chance of making an impact against the established names and consequently, bookmakers artificially reduce the odds on the more established teams and the draw, whilst increasing the odds on the newcomer. Remember, bookmakers don’t have a crystal ball and their prime function is to balance their books, not necessarily to predict with any great accuracy the final result. Every season at least one of the newly promoted teams is tipped for immediate relegation in the public’s eyes and bookmakers’ price these teams according to this perception until some statistical form becomes evident. By pricing the minnows higher the bookies encourage more money on the favourite and the draw, balancing their books along the way, and the number of surprise results mean they still make profit in the long run. For example, in the EPL most new teams will gather at least 30-40 points in a season from somewhere, which is at least a third of the games involving these teams, where the bookies will make a killing when the favourite fails to win. In 2009-10, EPL newcomer Burnley made the second largest profit of any home team; QPR made the largest profit in their home games during 2011-12; Swansea came second but made a loss the following season as they were much shorter priced in every game; Southampton made a profit in 2012-13 (one of only eight teams to do so), etc. There are of course exceptions to this rule, hence why newcomers are far too unpredictable. Therefore, during 2013-14 it is better to omit Cardiff, Crystal Palace, and Hull from your EPL strategies and concentrate only on matches between teams which have played the requisite last 25 home or away league games in the same league. Ultimately, we advise leaving newcomers well alone – there are still plenty of other matches to focus on without them. Learning to specialise is a key ingredient for successful gambling. Learn to leave the statistical grey areas alone.